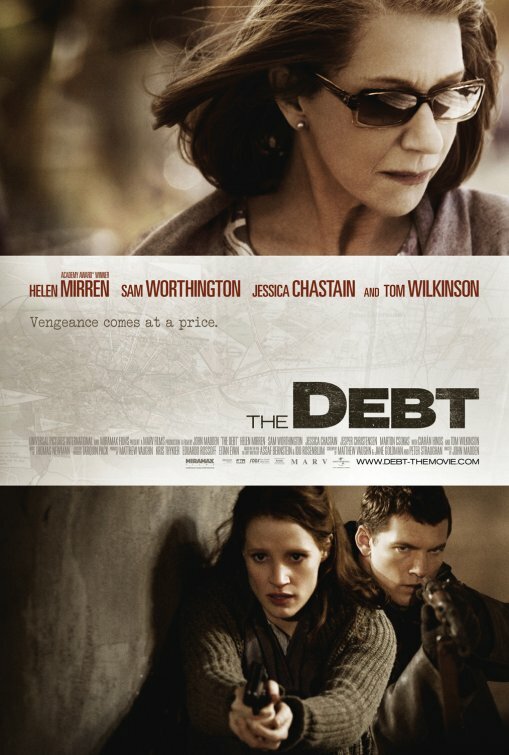 A tense and mature spy thriller that’s as well written as it is acted, The Debt is a thriller that even stops to ponder some serious moral ambiguities along the way. Back in 1965, a group of Israel agents (Jessica Chastain, Sam Worthington, Marton Csokas) were sent to Berlin to capture a notorious ex-Nazi doctor (Jasper Christensen) and bring him back for justice. When things don’t go according to plan, the group must decide what is justifiable in the name of moral cost. In 1997, the aged former agents (Helen Mirren, Cirian Hinds, Tom Wilkinson) have to deal with the full consequences of their actions. A far majority of the film takes place in the 60s, and it’s for the best considering that’s where most of the tension and interest reside. As a thriller, drama, and non-linear mystery, there’s always something going on. The film is not without its genre clichés, but the sequences of holding Christensen (Quantum of Solace) hostage rise beyond genre mucking. He is a true monster and his dialogues with the various agents are chilling, reminiscent of Hannibal Lector’s tête-à-têtes. The cast is uniformly good, even Worthington, but the real star is Chastain (The Help, Tree of Life). She is magnetic. It’s a shame that The Debt felt it needed to tie up its loose ends in a conventional ending that discards the film’s more ambitious moral quandary. I suppose the toll of false identities and moral relativism just doesn’t make audiences happy like good old-fashioned vengeance. I guess that’s a debt everyone would rather have paid. The movie seems to float on the effervescent air of 1930s screwball comedies, and in truth it does possess some of that snappy allure. Francis McDormand travels into the inner circle of the upper social classes in London and befriends a bubbly lounge singer, played by bubbly actress Amy Adams. The film moves at a ridiculously fast pace, sometimes too fast as it tries to pile on complications and setbacks. This day-in-the-life confection is sweet and well natured but rather too digestible. Once the movie is over I do not see myself ever dwelling upon it once again. It’s a pleasant and entertaining experience even if it dances right out of your memory.